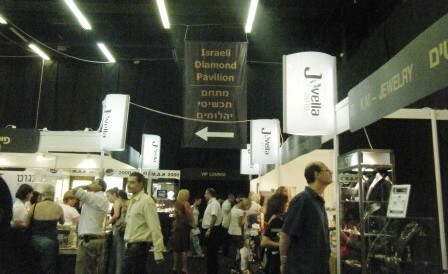 It may be a small show catering to a small market, but business at Jovella 2010, the 7th International Jewelry Exhibition in Israel, was thriving. The show featured about 150 exhibitors from Israel and abroad and offered jewelry, Judaica, watches, gemstones, jewelry services and technologies. There was also a section of young Israeli jewelry designers, whose creations were among the most innovative at the show. This year’s show hosted its first dedicated diamond pavilion. According to the Israel Diamond Institute website, a number of the companies located in the small diamond area were first time exhibitors who were using the show to expand their business base to local and overseas buyers. Diamantaire Edi Faltz said that owing to a lack of overseas buyers, the small show was not the best venue for more established diamantaires looking to do business. In order to make the fair a real focal point for the Israeli diamond industry, he said, the show’s organizers must make more of an effort to attract non-Israeli buyers. One of the ways they can do this, he said, was to cover their expenses like many international shows do. It was, he concluded, primarily a show for jewelers. After speaking to a number of jewelry exhibitors, there was no doubting this sentiment. “There was non-stop traffic from 10.30 in the morning until 9 o’clock at night yesterday,” said Saul Yarrow, of IBB Tel Aviv, an import/wholesale company for branded and fashion jewelry. “We wish we would see the same level of interest in shows such as Hong Kong or Vicenza that we are experiencing here,” he said, adding that the company had already received scores of leads for each of its brands, which include Brosway, Lovelinks and Miss Dee. According to last year’s figures, Jovella 2009 received 11,000 visitors. This year’s numbers have yet to be released, but they look to be way up. Jovella is organized under the auspices of the Israel Diamond Institute Group of Companies (IDI), the Israel Ministry of Industry, Trade and Labor, the Israel Export and International Cooperation Institute and the Israel Jewelry Manufacturers’ Association. The next edition of the Jovella show will take place from June 28-29, 2011. P.O.Box 3107, Ramat Gan 52130, Israel.